Welcome to Sol's Cliff House, the best rental house in Bar Harbor! Sol’s Cliff House is a large vacation rental on Mount Desert Island in Bar Harbor, Maine, overlooking Frenchman Bay and adjacent to Acadia National Park. 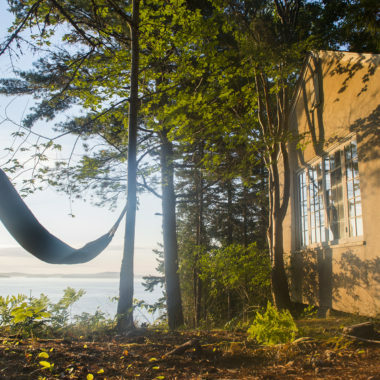 Nestled into twelve private acres of pine and fir, this Mount Desert Island rental delivers what we think is the most magnificent view on an island of incredible views. 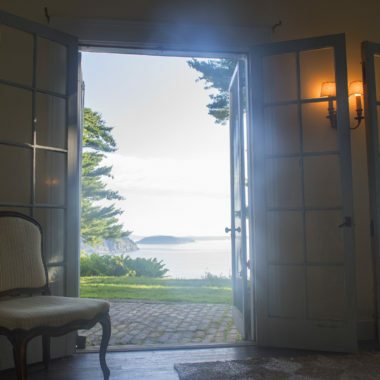 Our step-grandfather, New York lawyer-novelist Arthur Train, commissioned the house to be built by Boston architect George Shepard in 1914, making it one of the last surviving “summer cottages” of Bar Harbor’s gilded-era golden age. It barely survived the great fire of 1947. Large ground-floor rooms connect by double doors and a great front hall. 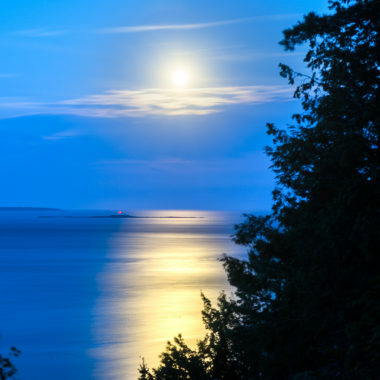 The entire east side overlooking the bay is lined with double French doors opening onto a brick terrace, affording wonderful views east across Frenchman Bay and the Porcupine Islands to the mainland and south to Egg Rock light house and the Atlantic Ocean beyond. 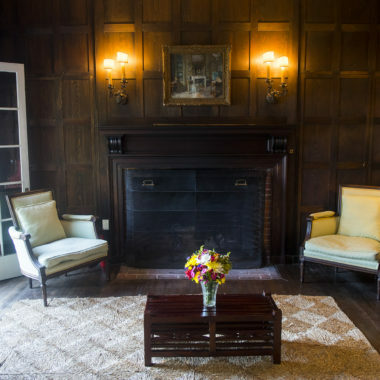 To stay at Sol’s Cliff House is to step back in time to an era of long family summers, house parties, vigorous exercise, domestic culture-and a note of extravagance. 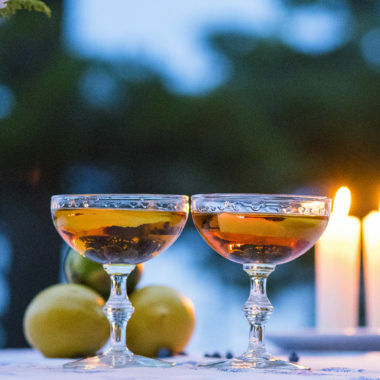 Enjoy this special place where Acadia meets Frenchman Bay, relax in the rhythm of lobstermen making their rounds (plus the occasional cruise ship passing in the distance), and rejuvenate where the mountain and sea air mingle. This Bar Harbor vacation house, about one mile from downtown, sits at the end of a private driveway off a private road (Sol’s Cliff Road) off Old Farm Road. 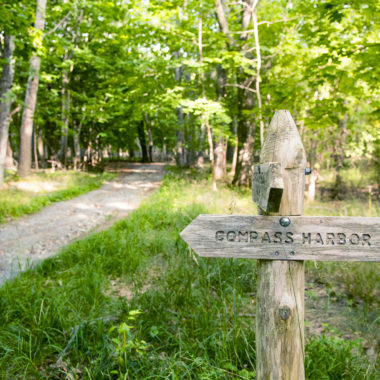 (Old Farm Road is named for the summer residence of George Dorr, “the father of Acadia National Park.” It is now a fascinating old foundation, in the woods as you walk from Sol’s Cliff to the beach at Compass Cove.) Sol’s Cliff House sleeps 22 people in its 12 bedrooms. The beautiful dining and living rooms are flooded with natural light and easily accommodate gatherings and seated dinners. 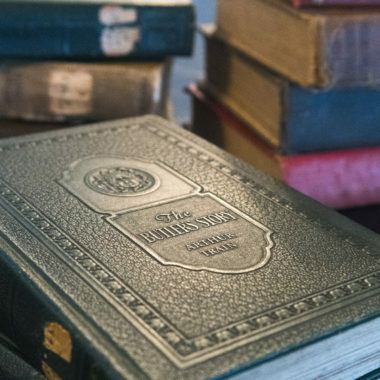 The library is home to a small collection of some of Arthur Train’s books and several others, offering a great Acadia National Park vacation refuge. The large kitchen is augmented by a butler’s pantry which opens onto a sheltered porch and picnic table with views of the bay below. 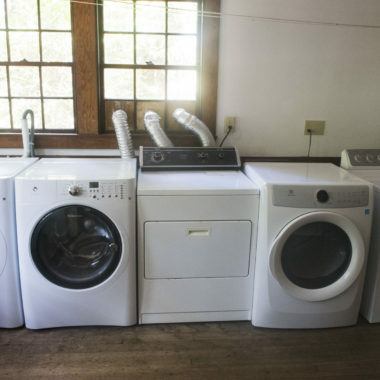 The house also includes a laundry room with several washers and dryers. 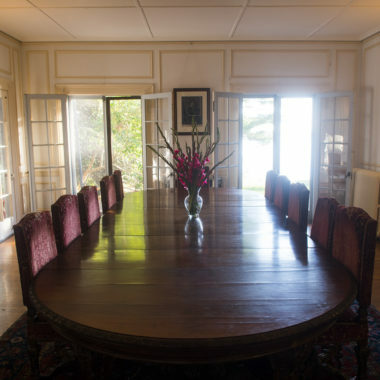 Other features include six fireplaces (the four on the ground floor may be used, with care), a second floor porch overlooking the water, a lengthy terrace running along the water side of the house with two sheltered, Italianate loggia picnic areas, and a large game house in the woods, with fun for all including wall tennis, badminton, a basketball hoop and pick-up soccer scrimmaging. Sol’s Cliff House is a great location for family reunions, yoga and corporate retreats, a destination for team and relationship building, weddings and rehearsal dinners, artists groups, avid hikers or just a great getaway for friends. I stayed here and had the most RELAXING vacation! Nothing beats walking through the first floor and passing by all the screen doors letting in fresh air, although sitting outside and reading a book or even working (some of us couldn't get away the entire week) with a breathtaking view in front of you was great too! We went on many wonderful hikes, went sea kayaking and even took a mail boat out to Little Cranberry Island for an unforgettable meal! This home is great because it has a huge kitchen and it's made to fit a big group be it friends or family. The fireplaces are a wonderful touch and all the antiques make it feel like you're in another time (which is really cool)! It's an unforgettable place, highly recommended! I was truly amazed the first time we pulled into the circular driveway. It felt like I had traveled through time and space to an English country estate where Hercule Poirot was about to solve a mystery. I loved everything about the house. The old world charm, the location, the amazing views. It was the perfect place for our group of friends to enjoy a wonderful Maine vacation. I can't recommend this house highly enough. This house is worth it for the view alone. I packed an ambitious amount of reading material but that went unaccomplished as the view overwhelms you with majesty and you just cannot take your eyes off it--the Mt. Desert Narrows, the Porcupine Islands, the lobstermen collecting traps. 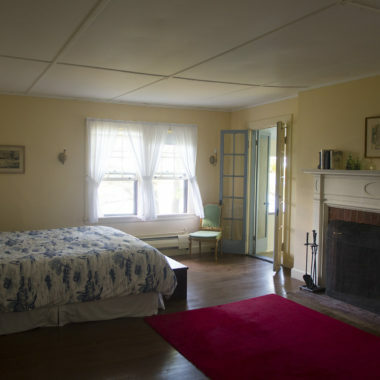 Inside, the house is spacious and full of historical surprises. A perfect spot for large groups not wanting to step on each other's toes. After long days of hiking, the library basically begs you to sit by the fire with a drink. The easy access to Acadia is also an incredible asset. Within minutes we could find ourselves climbing up mountains to even more incredible vistas. We opened the front door and our jaws dropped. The house itself is magnificent from floor to ceiling and the view off the cliff is breathtaking. While the historical detail fascinated me - even the doorknobs look original - it doesn't displace modern amenities. We cooked (and cleaned up) with ease. The location also can't be beat. The town is a walkable distance, the Schooner Head and Compass Harbor Trails are practically at the end of the driveway, and more challenging trails are minutes away by car. We want to come back next year. Highly recommend this home for large family or friend gathering. Words are inadequate to describe the view from the terrace and ocean facing bedrooms. It is completely isolated and yet very convenient to the town of Bar Harbor. Could not have found a better home for our large family and friends' gathering. We originally rented Sol's Cliff in August, 2011, to celebrate the 50th wedding anniversary of my parents. This house is fantastic for large family get-togethers of the extended clan, i.e., grandparents, children and grandchildren. The original trip went so well we returned again in August, 2012 & August, 2014, this time with an extended group of friends and our children (ranging in age from toddlers to pre-teens). Lots of fun to be in the same house and let the kids rollick around. It is quiet and secluded with incredible views over the ocean but a quick drive or easy biking distance to town (for all but the smallest bicyclists). 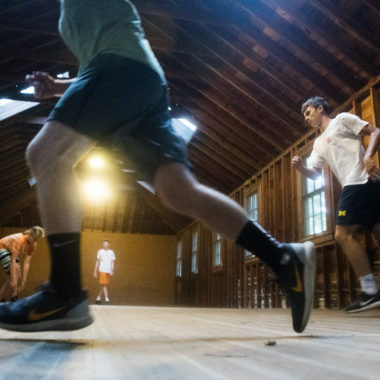 The house itself is an amazing example of architecture from a long-gone era when families would decamp to a place like Bar Harbor for the whole summer. Faded glory and rustic chic in the best way possible. 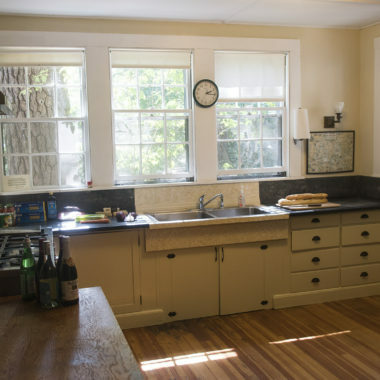 The kitchen is large, comfortable and functional. Handy grill outside. Owner was easy to work with, flexible, and prompt in communications. Has been in same family for generations. We hope to go back again in the future. We stayed at this house in September 2015. It was perfect! We were a group of about 12 and the house easily accommodated all of us (and would have fit quite a few more). The house is truly amazing-- apparently one of the last examples of the mansions from the halcyon days of Mount Desert Island. It definitely maintains its classic feel, but has been updated with modern amenities (like internet, which is a must for us and an issue on MDI at times, a grill, and a very well updated kitchen). The view off of the back porch is honestly one of the best I have ever seen, and while the house is well tucked away from others, it is a quick trip, either walking (20 minutes) or driving (3-4 minutes), into downtown Bar Harbor. Also very close to some of the better parts of Acadia, including the Dorr Mountain ladder trail and Mt. Champlain, and just a short walk through the woods to Compass Cover. We've been going to MDI for years and we all agreed this is the best rental we've gotten. Acadia is amazing, in terms of its natural beauty of course but also in terms of the history that made it the park it is today -- it's hard to articulate, but we all agreed that the house parallels those things well. We'd definitely return.